Motorola's new Moto E smartphone adds a front-facing camera, additional storage, a larger display and Android Lollipop. It's hard these days to get attention when you're introducing a new phone -- especially when many of the journalists who cover phones are getting ready to travel to the Mobile World Congress next week. However, Motorola managed by sending a mysterious email to reviewers telling them that they were going to get a package hand-delivered, and that the box would contain everything they needed to report on Motorola's latest device. What was delivered was a box that, rather cleverly, offered a small diorama of a "press conference," an invitation to access online information, including videos and other info, and the new, second iteration of its Moto E phone. The idea behind the Moto E is to offer a lower-end but still reasonably useful smartphone to people who can't -- or who don't want to -- pay for a higher-end device. To somewhat paraphrase our regular Android reviewer, JR Raphael, who reviewed the first Moto E last May: If you're a regular reader of this site, then this entry-level phone probably isn't for you. But it very well could be the right device for your less demanding friends or family members. At 2.6 x 5.1 in., with a curved back that goes from 0.2 to 0.5 in. wide, the new Moto E doesn't have the sleek metallic luster or slim profile of today's higher-end phones. It does have the same smooth rubber backing that the original Moto X had (although at 5.1 oz., the Moto E is perceptibly heavier). I found it quite comfortable to hold and use with one hand. Motorola has added a very interesting idea: Instead of last year's removable backplate, the rim of the phone is covered by a removable band made of slightly roughened plastic in order to improve your grip. So while the phone itself will come in either white or black, you can change the band to one of six different colors. It's a rather clever strategy for allow users to customize their phones without spending too much to do it. 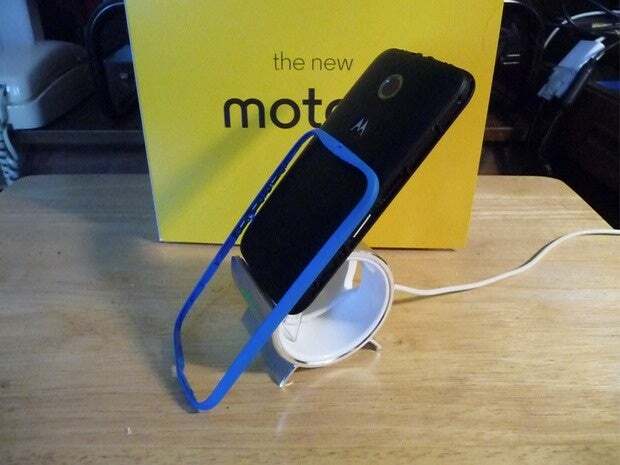 The Moto E uses colorful bands to decorate the side of the phone and make it easier to grip. The removable band also gives users easy access to the SIM card and to a micro SD card slot. The Moto E will take up to a 32GB SD card, which will probably be needed; it comes with 8GB of storage, 5GB of which is available for users. When the band is removed from the Moto E, it reveals slots for the SIM card and a micro SD card. At some point while removing this Moto E band, the edge surrounding the micro USB power port became bent; users who change bands regularly will have to be careful. The phone display has been made larger; from the previous 4.3 in. to 4.5 in., although it's still 450 x 960. As a result, the Gorilla Glass screen is somewhat easier to read, although it still doesn't have the clarity or brightness of higher-end phones. According to Motorola, the display has an anti-smudge coating and the entire phone has a water-repellant coating, so you can feel a bit easier if you (or your child) are accident-prone. Reflecting the importance of cameras to users these days. Motorola has added a front-facing VGA camera to the new model, while the rear-facing camera now offers 5 megapixels. And you can now use the same wrist-twist that the Moto X uses to start the camera. Other upgrades include a 1.2GHz Qualcomm Snapdragon processor, a 2,390mAh battery and support for 4G LTE (for an addition $30 over the base price of $120). And like the original Moto E, it comes with an FM radio (that you can use with headphones), which will be welcome to older users who are less used to Internet stations. As far as software is concerned, the new Moto E follows the lead of Motorola's other phones, offering a simple, clean version of Android 5.02 (Lollipop) without the bells, whistles and unwanted overlays that so many other smartphone vendors insist on. According to Motorola, the Moto E is available unlocked in the U.S. for $120 (3G) and $150 (LTE). The Motorola bands will be sold in sets of 3 for $20; there are also covers (that Motorola calls Grip Shells) available for $20 each. Current delivery times for the device are 7 - 10 days. Those of us who yearn after the slicker, high-end phones with their larger, brighter displays, more powerful cameras and wider range of features -- some of which will, no doubt, be introduced at the upcoming Mobile World Congress next week -- would probably not be satisfied with the Moto E. But for a very reasonable price, you can get an unlocked phone with most, if not all, of the features that most day-to-day users will need. And that ain't bad.